I have always loved weddings. Other than the birth of a child, it is one of the happiest occasions one can experience in their lifetime. It’s a day many dream about and when it finally happens it can be exhilarating and terrifying at the same time. Not that long ago, marriage ceremony options were somewhat limited. If you were raised in the church, you most likely would be married in a religious ceremony in your house of worship. Those who were not religious or did not belong to a church would likely hire a justice of the peace to perform their ceremony. In either case you likely had little or no say in the content of your wedding ceremony. Today,couples have the option of hiring someone who can deliver a variety of options for their wedding ceremony. My journey to becoming a Wedding Officiant is pretty eclectic. I was raised in the Christian faith and have always loved the church. I have also studied and have a great respect for other religions and faith traditions. When it comes to weddings, I believe that everyone wants and deserves a meaningful and sacred experience regardless of their belief system or background. As a longtime ally of the LGBTQ community, I was thrilled when marriage laws were changed to allow all loving couples to experience the rite of marriage. My prior jobs have included personal assistant to a clinical psychologist, parenting teacher, program director for a foster parent training program and national trainer for an international prison ministry. Although I didn’t know it at the time, all of these experiences have helped to equip me with the passion and skills I would need to become a Professional Wedding Officiant. I am married to my best friend and awesome husband, Danny. Ten years ago, we relocated from New Jersey to the Adirondack Region of Upstate New York when Danny retired. I was working for a medical practice at the time and continued to work for them remotely from my home office until the end of 2017 when I retired. We love living in this beautiful area of the country where there are so many wonderful outdoor activities, festivals and events. We adore our friends and community and both enjoy volunteering for several local charities and events. In 2009, I began working with a local wedding association helping out with events and wedding shows. It was a great way to learn about the wedding industry and to meet a lot of really great wedding professionals. I was especially attracted to wedding officiating and became ordained through American Marriage Ministries in 2011. 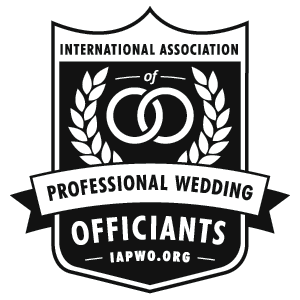 Being a Professional Wedding Officiant is now my full-time vocation and passion. For me, this is so much more than writing and delivering a wedding ceremony. Remember that part in the beginning when I talked about how your wedding day can be both exhilarating and terrifying? My role as your Wedding Officiant is to yes, give you an awesome ceremony experience, but I’m also there to set the tone for your day and provide that voice of calming reassurance to settle the scariest of nerves. As a seasoned officiant, I’ve encountered all sorts of unexpected hiccups and mishaps and have learned how to expertly overcome them. I can turn a mistake into a fun and funny add-on to your ceremony. No extra charge! I am humbled and honored to be able to share that sacred time and space with you on your wedding day. Because I take the time to get to know you and become your partner and friend in the process, you are not standing in front of a stranger, but someone who has walked with you on your wedding planning journey and is as excited about your wedding ceremony as you are. I continue to maintain and enjoy friendships with several of my past couples. I love that. When a couple hires me to be their day of coordinator, they not only get my help, but the services of my trusty assistant and all around great guy, Daniel Epstein (you can call him Danny). Because most weddings have multiple vendors and a lot of moving parts, it really takes two to adequately coordinate and communicate with you, your guests and your vendors. We work together seamlessly in the background to ensure you and your guests have a fabulous stress free day.